Europium is a rare earth metal which is soft, ductile, silvery-white in colour and instantly oxidizes in air and water. Europium is mildly toxic and ignites in air at temperatures in excess of 150 C to 180 C. it is one of the least abundant elements in the universe and is mainly found in the minerals monazite and bastnaesite. Globally, technological development in the field of earth metal nano-crystals, rise in the demand for flat panel displays and LEDs, and increasing civil infrastructure are the prime growth drivers of europium market. In addition, increase in adoption of europium for newer end-use applications, and emerging economies such as China, India and others will create new opportunities for europium market. However, higher cost of the research and development, and stringent government regulations are the key restraints for europium market. This report identifies the global europium market size in for the year 2014-2016, and forecast of the same for year 2021. 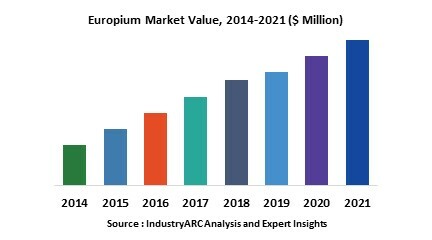 It also highlights the potential growth opportunities in the coming years, while also reviewing the market drivers, restraints, growth indicators, challenges, market dynamics, competitive landscape, and other key aspects with respect to global europium market. Geographically, Asia Pacific dominates the europium market, and is projected to have the fastest growth, owing to rapidly increasing population, rising living standard and growing disposable income in emerging economies such as China and India in this region which is fuelling the demand for consumer electronics and LEDs. Among all the end-users, consumer electronic segment has the highest market share in europium market.